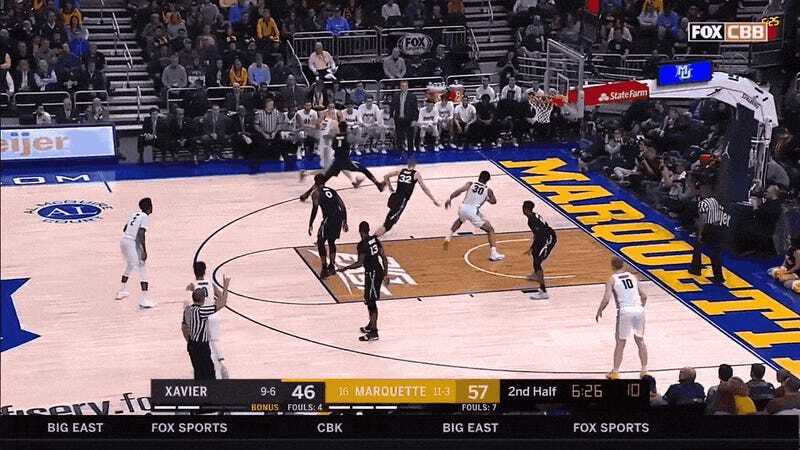 Marquette’s 70-52 win over Xavier on Sunday wasn’t especially exciting, since the Golden Eagles never trailed and spent most of the second half up by double digits. But if there was a moment when a struggling Xavier team looked to have a glimmer of hope, it was with about eight minutes to go in the game, when the Musketeers put together a little 8-0 run to cut the deficit to 11. 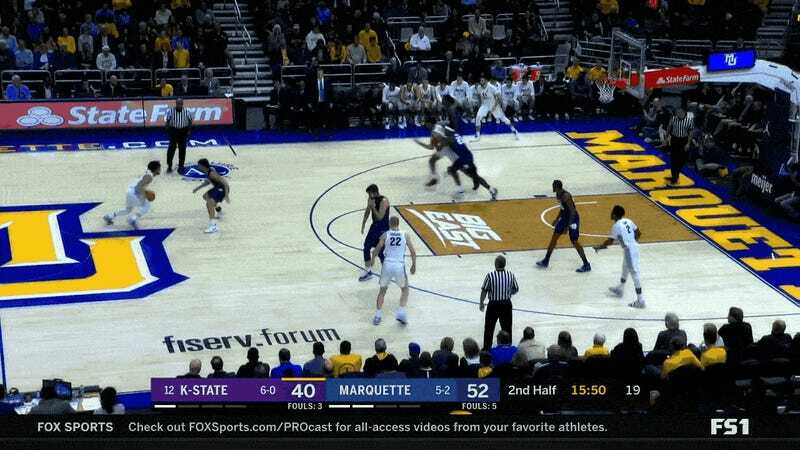 When Marquette point guard Markus Howard hit a three to pad the lead out to 14, Xavier forward Ryan Welage responded with a longball of his own to negate it. But on the ensuing Marquette possession, Howard hit another three—his fifth of an eventual six on the game—that had no possible rebuttal. The ridiculous distance on the shot is immediately impressive, but the size that Howard gives up makes it even more remarkable. The Golden Eagles guard is listed at 5-foot-11 (I’m unclear if that counts his hair or not), while his defender, Naji Marshall, is 6-foot-7. None of that matters to Howard, who confidently slays the giant by stroking the dagger, sending Marshall trudging back down the court with his hand held high in disbelief. This is what Markus Howard can do to people. Howard, now a junior, has been scoring like crazy ever since he got to Marquette, but since the graduation of the equally sized and also quite talented Andrew Rowsey after the 2018 season, Howard has become the sole commander of this group. Though he got 26 points on 10-of-21 shooting to go with eight assists, Sunday’s performance was far from Howard’s best of the year. His 45-point day against Kansas State at the beginning of December is certainly a contender, but his magnus opus so far this season was the night he had against Buffalo a couple of weeks ago. In the second half alone, Howard went off for a 40-point inferno that delivered Marquette a 103-85 victory after they were merely up 39-38 at the break. With nine threes in the game off 13 attempts and a mind-blowing late run of 24 straight points for his team, Howard mercilessly piled on the misery until the Bulls were buried. 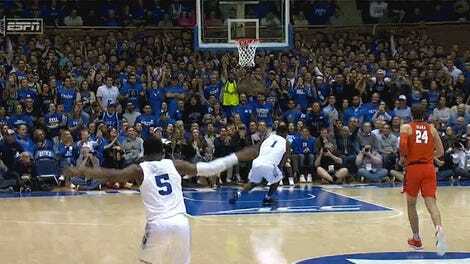 He took particular pleasure in hitting a trio of deep balls over big Buffalo center Nick Perkins. Howard, though amazing, is certainly not perfect, and a few very good teams have proven that it’s possible to stop him. Early in the season, Indiana came out with aggressive defense that forced him into three turnovers in the first two-and-a-half minutes, and a tough Kansas defense, particularly inside the arc, forced a 6-of-23 game from the field. More pressingly, Marquette got crushed by St. John’s on New Year’s Day, and the 6-11 wingspan of defender Justin Simon actually bothered Howard in a way that Xavier’s Naji Marshall failed to recreate, leading the Golden Eagles point guard to a 2-of-15 shooting night. But still, despite the occasional off game—and especially when you consider that those three games are Marquette’s only losses—it’s not hard to make the case that Markus Howard is the most valuable player in college basketball. Howard uses 33 percent of his team’s possessions when he’s on the floor, while the next-highest Marquette starter (Sam Hauser) is at 18.9 percent. That’s not quite Trae Young’s Oklahoma, but this year in college basketball, that 14.1 percent gap between first and second options is the largest on any major conference team. Dominant Big Ten players Carsen Edwards and Ethan Happ come close, but even they have a more active second option in Matt Haarms and D’Mitrik Trice, respectively. With his 17 shots per game, Howard brings in 24 points a night, which is more than anyone at a major school save Edwards. When he is determined to score, it takes prayer as much as it takes talent to stop him. Brothers Sam and Joey Hauser provide Howard with reliable perimeter targets for when defenses key in on the point guard too much, and Howard’s season-high eight assists in the Xavier win showed signs of an encouraging adjustment after the St. John’s debacle. 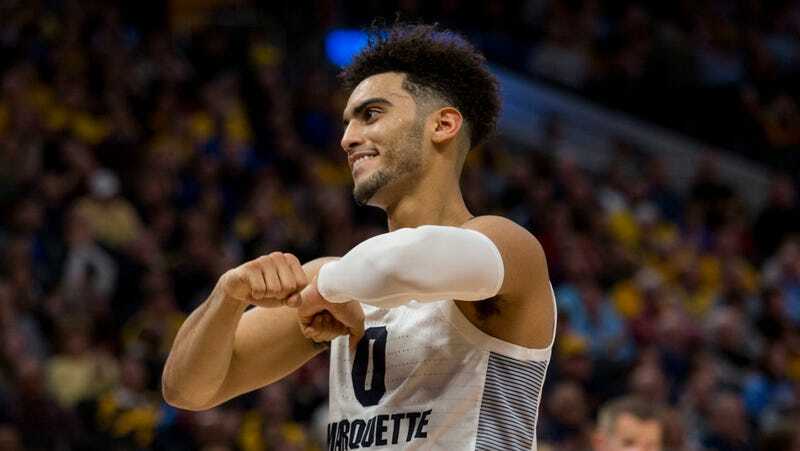 But by and large, Marquette’s fortunes will rise and fall with the scoring abilities of Markus Howard, and that’s perfectly okay for the Golden Eagles. Howard’s taken on the increased responsibilities of this season and turned Marquette into a legit contender for what should be a wide-open Big East title race. For an opposing team, the prospect of facing down this tiny, cocky, impeccably accurate leader and not having the answers to his inevitable barrage of shots must be terrifying.